Experience relaxed top Upington accommodation at African Vineyard Guest House & Wellness Spa on Kanoneiland, 25km from Upington and 15km from Keimoes on the island of slow living. African Vineyard is the perfect jewel to experience the Green Kalahari in the Northern Cape. Located among lush vineyards on Kanoneiland, the largest inhabitant river island in South Africa, this award winning 4-star & AA superior guest house is also home to one of the few signature Kalahari Spas in South Africa, using Kalahari ancient desert products. Escape and disconnect from the big city life and revitalize your body, soul and mind at the Wellness Spa with an added Outdoor experience. African Vineyard combines magical ingredients to create an unforgettable farm stay experience that includes free Wi-Fi. The ambience, food, treatments, personalised service and modern accommodation combine to deliver country hospitality at its best. Guests are welcome to experience the wellness spa, enjoy the exquisite garden and rich birdlife, experience local food and wine pairings or relax at the poolside. Spacious, beautifully appointed rooms, from standard to luxury, open out onto the green oasis of a garden that is alive with birds. Dinners are served on request, as are six-course food-and-wine pairings (bookings essential). African Vineyard is uniquely located on a working grape farm on Kanoneiland (“Cannon Island”) in the middle of the Orange River, South Africa’s longest river and offers a lovely venue for weddings, functions and conferences. 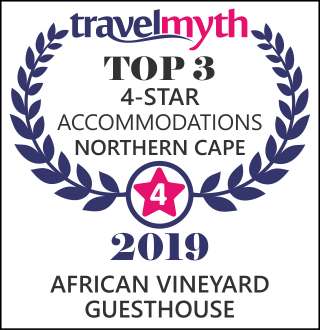 Whether your wish is to go river rafting, game viewing, bird watching, wine tasting or on a scenic photographic safari, African Vineyard is an ideal stop over on route to some of South Africa’s most iconic destinations in the Northern Cape. 260km from the Kgalagadi Transfrontier Park, a vast wilderness that straddles the borders of South Africa and Botswana, and is home to black-maned lions, magnificent birds of prey and the iconic scenery of the Kalahari. Directions (from Upington or Keimoes): Take the Kanoneiland turn-off from route N14. Drive for 3km over the bridge that crosses the Orange River. Turn right into the town and then left into the main road. Follow the African Vineyard signs for 1km and turn right onto a gravel road. About 500m on, African Vineyard is the first establishment on your right. 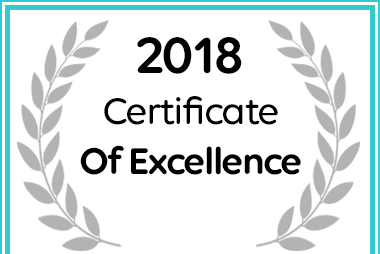 African Vineyard Guest House & Wellness Spa received a Certificate of Excellence for 2018. 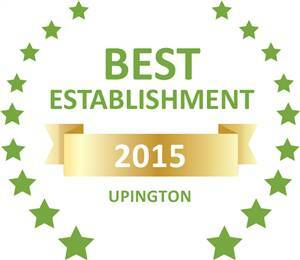 Based on reviews of establishments, African Vineyard Guesthouse has been voted Best Establishment in Upington for 2015. Copyright © 2014. African Vineyard Guest House. All Rights Reserved.